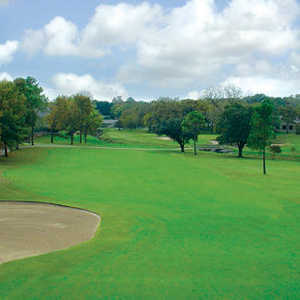 FORT WORTH, TX -- It's a nostalgic time around Glen Garden Country Club, a place where two teenaged caddies, Ben Hogan and Byron Nelson, started on a golf journey in the 1920s that is historic and legendary. In a few months the clubhouse that has been used since 1912 is coming down. A new one, costing $1.2 million is under construction in front of the historic building that includes a ballroom and restaurant. Nelson was on hand for the ground-breaking ceremony. Memorabilia, including old photos and newspaper articles, cover the walls of the old clubhouse, where LPGA great Sandra Palmer, also got started. Thank goodness all that can be moved into the new building. As the story goes, Hogan was quiet, small and shy. Nelson was a tall 6-foot. And on a singular day in 1927 they competed against one another in the Club Caddie Championship. Nelson sank a long putt on the final hole to edge Hogan by one shot. "I was 13 when I first started playing at Glen Garden," Nelson remembered. "Ben and I were 15 when we competed for the Caddie Championship. I won a five iron and Ben won a two iron. Since he already had a two and I had a five, we switched." Neither legend-to-be realized this scenario would repeat several times through the years. Hogan turned pro in 1930 and Nelson followed in 1932. They were both from Texas, but the styles were opposite. Nelson studied Harry Vardon's writings and played as often as possible. One day in the Texas Open Pro-Am, Scottish pro Bobby Cruikshank noticed Nelson's golf grip as they played the round together. Afterwards, the Scotsman delivered this famous quote: "Laddie, if ye don't lam to grip the club right, ye'll niver make a good player." Hogan's early days were cursed by a duck hook. He played the tour and ran out of money. But he was not going to give up. For Hogan it was practice, practice, practice. In the 1940 Texas Open, Hogan and Nelson again were tied at the end of regulation play. In a radio interview after that round Hogan said: "Byron's got a good game, but it'd be a lot better if he'd practice. He's too lazy to practice." The easy-going Byron answered with his sticks -- he again won the play-off by one stroke. Nelson later said: "It seems as if I played better against Ben on the average than I did against anybody else. I tried harder against him, because I knew I had to." In the 1942 Masters the two again would tie at the end of regulation. Nelson won again, and said he was so nervous the evening before that he tossed and turned with no sleep and threw up the next morning. The other pros on the tour were so captivated by the duo, they remained in Augusta and watched the playoff. Nelson also won the 1937 Masters, a U.S. Open and two PGA Championships. But he is most known for 1945, when he won 18 tournaments, including 11 in a row. His fluid golf swing was the pattern for the mechanical "Iron Byron", used in golf tests today. Nelson was inducted into the PGA Hall of Fame in 1953, and the PGA tournament in Dallas that bears his name, the Byron Nelson Classic, remains the only PGA Tour event named in honor of a golfer. Nelson retired at the age of 34. "People ask me all the time why I retired so young," Nelson said. "I had a life-long dream of being a rancher and back then I wasn't making enough money on the tour." So Nelson bought his ranch in Roanoke, Texas, where he lives today. Ken Venturi met Nelson as a youngster growing up in the Bay Area around San Francisco. "He took me under his wing and guided me," Venturi said. "After he retired in 1946, we played exhibitions up and down the West Coast. On every first tee, Byron would say 'What's the course record? Who owns it?' I finally asked him why he always asked that. He said 'Ken, you always ask because if the home pro owns the course record, you don't break it. That pro lives here. We're just visitors.' That tells you what Byron Nelson is made of. Byron is the finest gentleman I've ever known." Hogan was called the Ice Man and the Hawk. In February 1949 he was almost killed in a head-on car crash. Doctors told him he would never play again, but he won six of the next nine majors he played after the accident. Hogan won 63 times and that is third all-time behind Sam Snead's 81 and Jack Nicklaus' 70. Only Nicklaus, Gene Sarazen and Gary Player also won the Masters, U.S. Open, PGA Championship and British Open in their careers. Hogan's four U.S. Open wins, 1948, 1950, 1951 and 1953, were matched only by Nicklaus, Bobby Jones and Willie Anderson. His Masters' titles came in 1951 and 1953. He last won the tour in the 1959 Colonial Invitational. He won five times at Colonial and died at age 84 in Fort Worth in 1997. Today, both are immortalized with bigger-than-life statues. Nelson's fronts the first tee at the TPC at Las Colinas in Irving and Hogan's likeness can be found overlooking the 18th green on a walkway next to the clubhouse at Colonial in Fort Worth. Directions: From downtown Fort Worth take I-35 south, east to Berry Street, right on Glen Garden Drive. Tee times/reservation policy: Club members have priority. Semi-private course. Greens fees: Weekdays: $25, weekends: $35, includes cart. My father caddied at Glen Garden in the 1920's with Nelson and Hogan. In the late 1960's I met Byron Nelson at the Colonial Tournament and asked him if he remembered by father and he said he sure did. He asked how he was and said they used to play golf together at the old Katy Lake course which I had been told by dad. When I took up golf in the early 1960's dad asked if I would like him to call Byron Nelson and get him to show me a thing or two....like an idiot I did not take him up on it...after all Palmer and Nicklaus were the big names then. A really nice golf course. When you play there, you can 'feel' the history. The grounds are in great shape and the greens are true. Its wide fairways are deceptively challenging. If you are a par golfer, you may not find much of a challenge here. But, if you normally shoot mid 80s and up, you'll enjoy this course. Don't miss out on this hidden treasure!